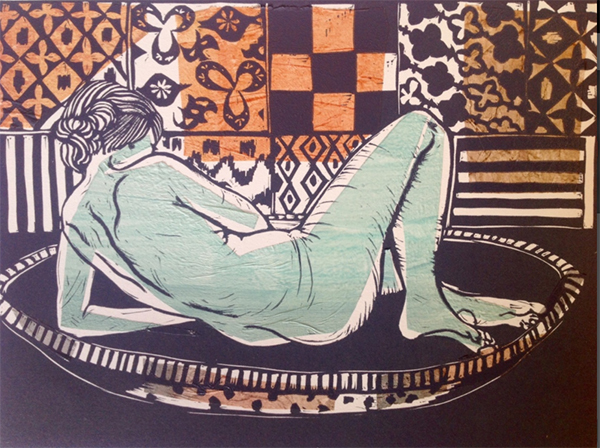 Jacquin: How did you connect with printmaking as your preferred medium? 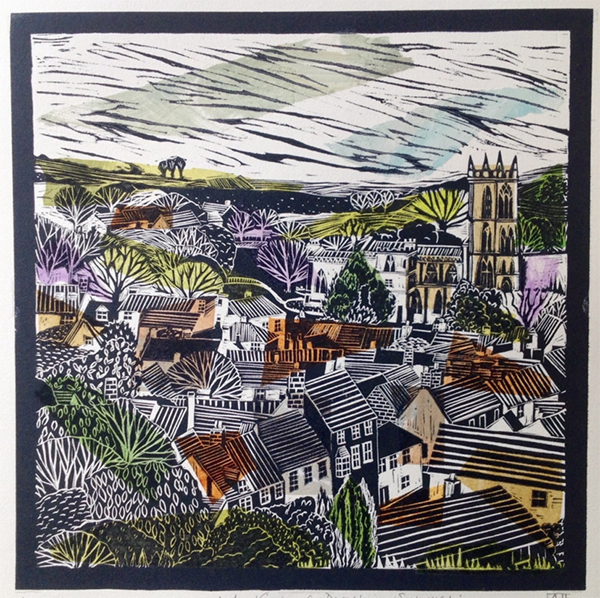 Alison: I have always enjoyed looking at printmaking and buying etchings, screenprints and Linoprints. The textures and smooth luminous quality that you find in this kind of artwork fascinated me. And although I’ve always loved painting and drawing I wanted to try something new art wise so when I saw a course in printmaking four years ago I decided to sign up for it. 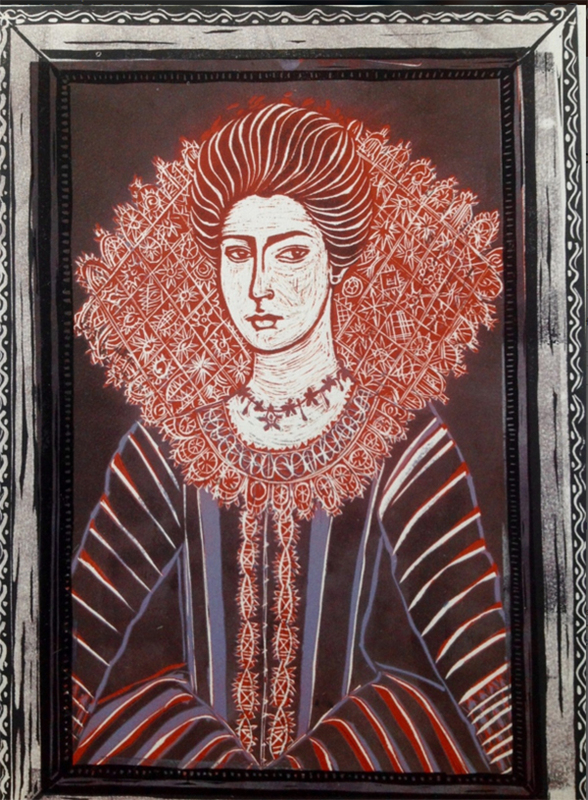 Even though I tried all the other techniques in printmaking (etching, etc. ), it was Lino that instantly clicked with me. Jacquin: What has been your favorite print to date? Alison: I can honestly say that each piece has a special place for me. However, if I was to choose a significant image that I am drawn to more generally, it would be portraits. I am especially fascinated by faces and love creating slightly oddball images that would possibly not happen in real life, like a bird standing on a girl’s head or a beautiful butterfly landing on the tip of a lady’s nose. “Bird Perch” pictured above. 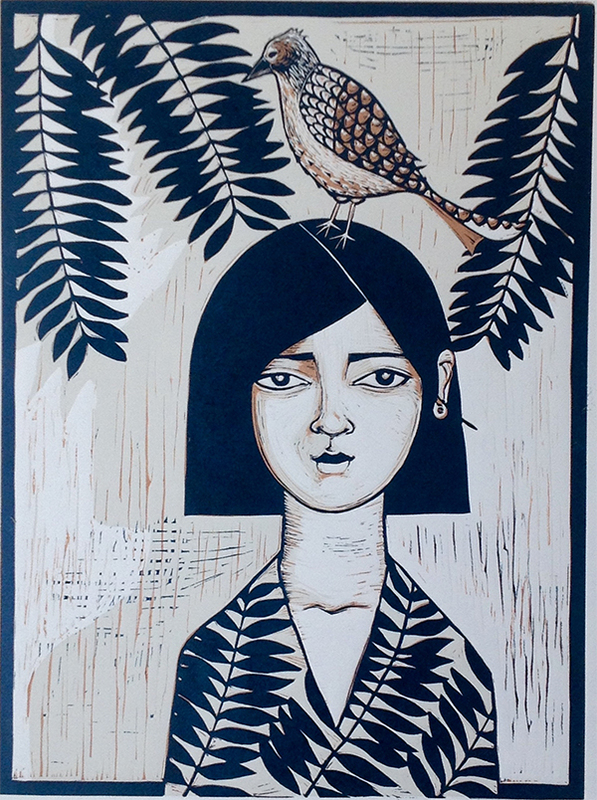 Jacquin: Tell us about your printmaking process. Alison: I spend a lot of time on designing the image. 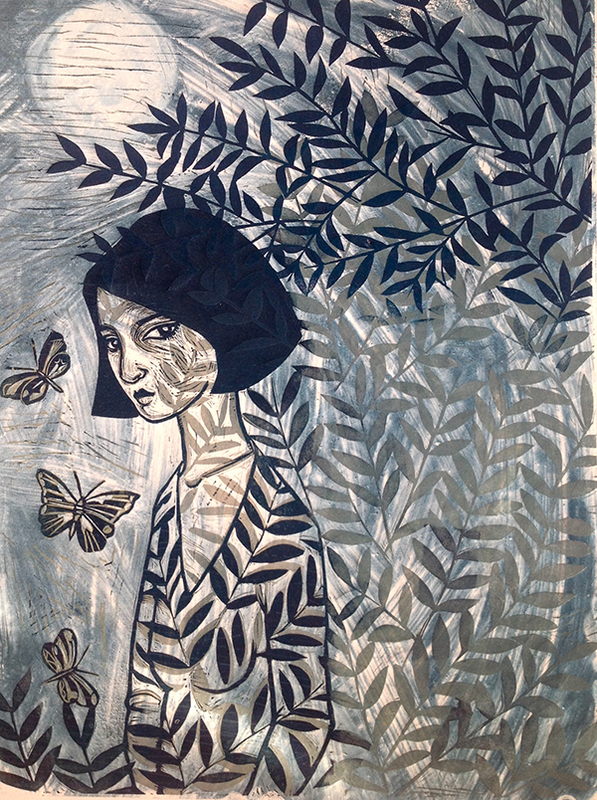 I usually draw an idea over and over until I feel I have the perfect balance for the Linoprint. When I am finally satisfied I will trace my design onto the block and start cutting. Depending on the size and design, this can take many many hours, not to mention blistered fingers and hands. Jacquin: How do you select the subject of your works? Alison: My head is literally brimming with images I want to create on Lino. It can get quite frustrating since I have to be selective, as not everything I think up will work well as a finished Linoprint. Sometimes I’ve worked on a design for ages even traced it onto the Lino and then realised it just won’t work well so have to scrap it. 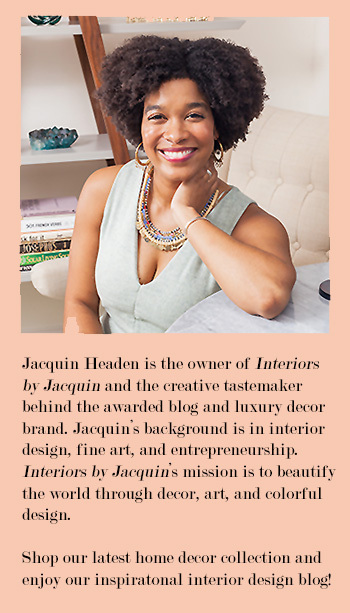 Jacquin: What is inspiring you currently? Alison: I am inspired by so many things it’s difficult to pin point just a few things. Matisse is definitely the artist I’m drawn to when ever I need an extra shot of inspiration. His ability to pare down an image to its essential lines and then turn it into something beautifully decorative is awe-inspiring! I also love illustration and often think that some illustrators are in reality true artists! Ana Juan and Olaf Hajek come to mind as artists/illustrators but honestly these are a tiny taste of what inspires me. Jacquin: What would the perfect day be like for you? Alison: My Perfect day would have to be a sunny one (something which is rare in the UK). I love love love spending time in London. Definitely going to an exhibition, the Tate Modern is one of my favourites and the shop there is a treasure trove for art books. Then enjoying Dim sum in Soho, a walk by the river and catching a play or going to the comedy store, finished by cocktails and dinner in a small French Bistro near Convent Garden. Perfect! 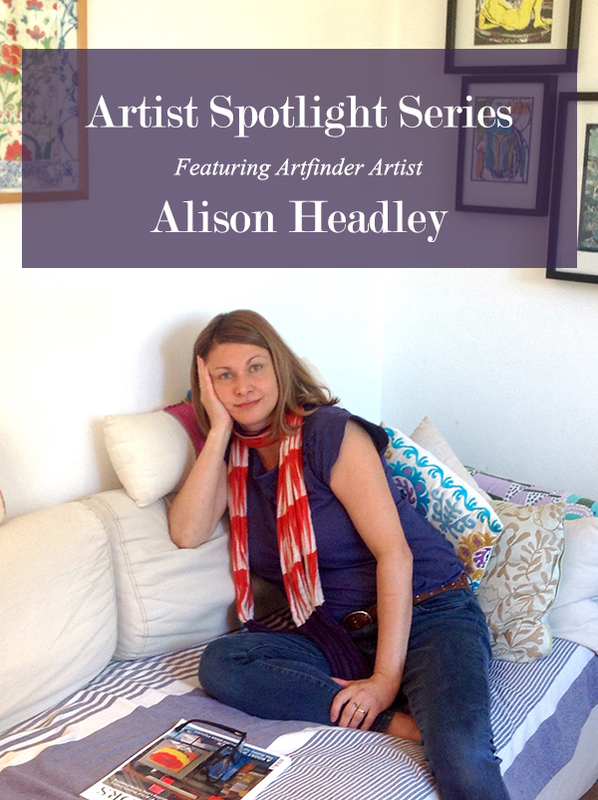 To learn more about Alison Headley, visit her Artfinder page here.